Since I'm fairly sure my brother and/or sister-in-law don't read this blog, I'm going to post about my Christmas presents for my niece, because I'm just so dang proud of them. First is what I'm calling "The Toddler-Proof Dress". My niece is about 18 months old and while I'm yet to meet her (we live two solid days' drive away - don't judge me! ), I've seen plenty of pictures on Facebook. By all appearances, she seems to be a standard toddler: bursting with smiles, curiosity and a teeny weeny bit too much energy. Enter the toddler-proof dress. It's just your basic pillow-case dress, but with a few special extras, designed just for toddler-sized issues. Here's the flyer I made to go with the present, considering I won't be there to explain how the extra features work. Pretty pretty bow (because every little girl loves bows!) - Also to assist with coordination as she gets older and can tie her own bows! Soft elastic shoulder straps! Good for safety [meaning she won't be able to pull the ribbon and strangle herself, like in a traditional pillowcase dress! ], easy to put the dress on and take it off, plus the bow makes the straps adjustable, so it also accommodates growth spurts! 100% cotton fabric means easy case and easy stain removal! ... then iron it flat! 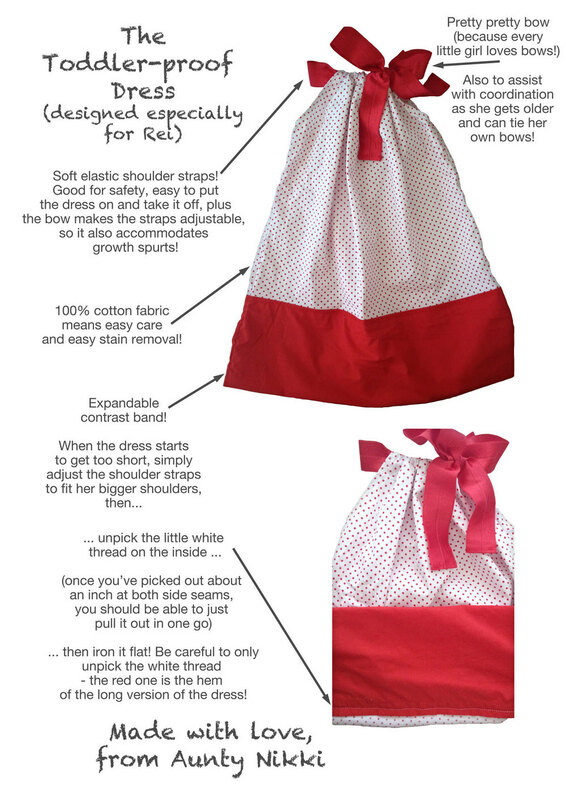 Be careful to only unpick the white thread - the red one is the hem of the long version of the dress! Curious about the little white thread? I'll bet you are! When I was sewing on the contrast band, I decided to use the whole band as the hem binding. After folding the raw edge under, stitching it down and then halfway through stitching it to the main part of the dress, it occurred to me that if it was too short for my niece, then it would be really easy to just unstitch that last step (the step I was halfway through) and hem the raw edge. Unfortunately, my sister-in-law is not a seamstress. As far as I'm aware, she doesn't even own a sewing machine (gasp!). Therefore the plan going through my mind was not going to work. I was going to have to figure out a way to make it work. I used white thread in the bobbin, so it would be easily visible and therefore easy to remove when the time came. I then dialled back the tension on the upper needles so the bobbin thread would be straight-ish and easy to pull out. Then, because I both love and hate my twin needles, I did a test run on some scraps of the same fabric to make sure my plan would work - and it did! I used elastic ribbon (actually foldover elastic, but it's pretty and shiny, so that counts, right?) instead of regular ribbon, more from serendipity than anything else. I was rummaging around in my trims box, when I pulled out the foldover elastic instead of the red satin ribbon. I'd briefly toyed with the idea of making a sash/tube with some red knit, or including some elastic on the inside of the ribbon casing, but shelved the plans out of laziness, despite the intention of a strangle-resistant fastening. So when my fingers grasped the foldover elastic, I knew I had the solution. Worst case, she (the sister-in-law) can always replace it with a proper ribbon if she really hates it. On a side-note, pillow-case dresses have always struck me as horribly dangerous for such an energetic demographic. Am I overly concerned? I just haven't had to deal with that many small children, so I really have no idea. Either way, doesn't seem safe. Anyway, moving on to present #2: The Hello Towel. Enamoured with the Hooded Towels by Amber from Crazy Little Projects, I decided to make one featuring my niece's favourite pop icon: Hello Kitty. After all, I'd seen Amber's lions and tigers, how different could a cartoon cat be? I bought the best fluffy towel I could find at a reasonable price, which turned out to be a bad idea, because it was really hard to sew through. On top of that, the ears were too short, the face too wide, and the whole thing felt just not quite right, but overall, I think it was a good first attempt. Looking at the photo two weeks later, it looks much better on a roughly-head-shaped-object than it did when I was folding and wrapping it earlier today, so I think that's okay. I do like how the bow turned out. Fleece was perfect for making the bow both full and squishy, although my appliqué skills need some work. And there you have it! Two hand-made Christmas presents, with oodles of thought put into them, if not oodles of cash. Plus, I got to use my shiny new overlocker for both!